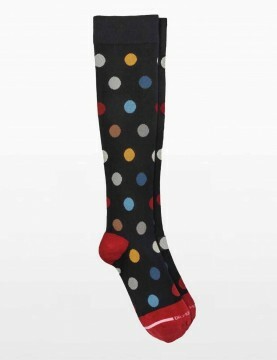 Spotted everyday compression socks support and relieve your tired aching legs and feet. They're formed with non binding, comfort band construction as well as graduated compression (8-15 mmhg) to maximize circulation & to reduce muscle fatigue. Dr Motion compression socks come in a variety of fabulous patterns, you'll never know they are compression socks, except when your feet don't hurt at the end of the day. Not your grandma's compression stockings. 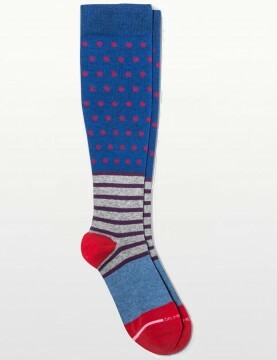 These graduated compressions socks are bright blue with spots & stripes and are perfect for those that love color. Women's Striped knee hi compression socks, you'll never know they are compression socks , except when your feet don't hurt at the end of the day. 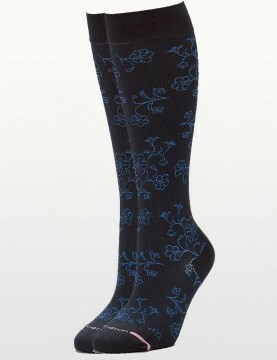 Delicate off blue floral design grace these amazing navy Mild Compression socks by Dr Motion.These socks feature a Compression level of 8-15 mmHg which make them extremely comfortable to wear all day, every day. 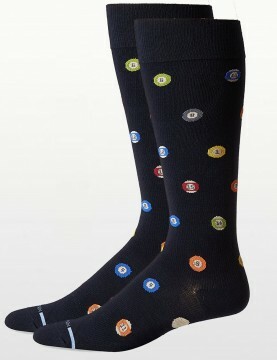 Dr Motion knee hi compression socks in black with pool ball print, you'll never know they are compression socks , except when your feet don't hurt at the end of the day. 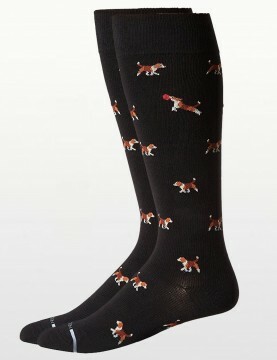 Dr Motion knee hi compression socks in black with dog print, you'll never know they are compression socks , except when your feet don't hurt at the end of the day. Men's Blue Spotted everyday compression socks are perfect for men who sit or stand for prolonged periods and would like to avoid tired legs and feet. Cotton Blend Knee Hi socks with graduated compression of 8-15mm Hg to aid circulation.